University of California--Riverside is a public institution that was founded in 1954. It has a total undergraduate enrollment of 18,782, its setting is urban, and the campus size is 1,200 acres. It utilizes a quarter-based academic calendar. University of California--Riverside's ranking in the 2016 edition of Best Colleges is National Universities, 121. Its in-state tuition and fees are $14,050 (2015-16); out-of-state tuition and fees are $40,973 (2015-16). Despite its setting in Southern California, UCR has a distinctly Scottish feel. All residence halls at the University of California—Riverside are named for landmarks in Scotland, including Aberdeen-Inverness and Pentland Hills. Student athletes compete as UCR Highlanders in the NCAA Division I Big West Conference. The school's original mascot was a live Scottish terrier; today, sports teams are supported by a kilt-clad bear named Scotty. Members of the student Pep Band don plaid berets and sashes as they play the "Brave Scots" fight song at sports matches, and students who play the bagpipes or drums can join the school's Pipe Band as well. 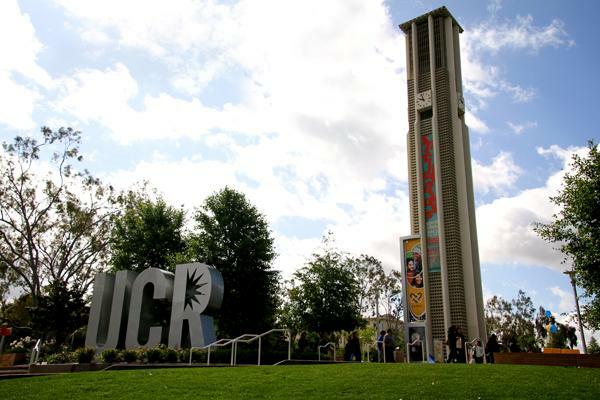 About 70 percent of UCR students are commuters, and freshmen do not have to live on campus. Students may want to hang around after class, however, for notable annual events like the fall Block Party and Spring Splash. There are more than 300 student organizations to check out, too, including about 40 fraternities and sororities. Freshmen can ease into college with the help of the First Year Success Series, a combination of seminars and workshops that teach students study and time management skills. Riverside is in an ideal location for road trips, with Disneyland and Orange County within a 40-mile drive and Los Angeles about 60 miles away. UCR is one of 10 schools in the University of California system and was the official UC Citrus Experiment Station before becoming a university. In the years since, faculty researchers have bred several new types of fruit, including the Melogold grapefruit and the Golden Nugget orange. Today, the university offers well-regarded graduate programs through the Bourns College of Engineering and Graduate School of Education. Notable alumni include Pulitzer Prize-winning editorial cartoonist Steve Breen, best-selling mystery novel author Elizabeth George and Nobel Prize-winning chemist Richard Schrock. UC Riverside is at the crossroads of Southern California - and at the major issues of our time. Our student body of 22,000 is the most diverse in the University of California system; these high-achievers reflect the sweeping demographic changes that have marked the California Experience in recent decades. Almost 60 percent of our undergraduates are first in their families to earn college degrees. Our faculty of 650 scholars is distinguished by more than a century of impactful research, and today UC Riverside is a living laboratory for the exploration of issues critical to communities at home and abroad. Our growth has mirrored the growth of Southern California and we are seeing our faculty and students gaining greater recognition on the national and international stage. The Washington Monthly and Time magazine both rank UC Riverside at the top of universities for success with low income students. UCR was included among six "Next Generation Universities" by the Lumina Foundation. The campus has excellent town-gown relations with the City of Riverside, which was named 2012 "most intelligent city" by the Intelligent Community Forum. UCR music festivals "Block Party," "-Heat" -and "Spring Splash" feature big-name eclectic headliners. Past performers include Common, Big Sean, Mos Def, No Doubt, Lupe Fiasco, The Cataracs, Far East Movement, N*E*R*D, Plain White T's and The Roots. See live bands downtown or catch a show at the Fox Performing Arts Center, a restored 1920s theater. Plus, LA and all it has to offer is just a short drive away. The UCR California Museum of Photography, Sweeney Art Gallery, Culver Center of the Arts puts world class art right around the corner. UC Riverside encompasses seven main academic units: The College of Humanities, Arts, and Social Sciences; The College of Natural and Agricultural Sciences; The Marlan and Rosemary Bourns College of Engineering; The School of Business Administration; The Graduate School of Education; The School of Medicine; and The School of Public Policy [opening to students fall 2015]. The campus offers: 80 bachelor's degree programs, 46 master's degree programs, 38 Ph.D. degree programs and 17 California teaching and administrative credential programs. The campus had 27 doctoral programs ranked in the National Research Council 2010 assessment, including 16 that rank among the top half of programs surveyed, five programs in the top 20 percent, and two programs in the top 10 percent nationally. UCR has ranked No. 54 in the world in papers published in Nature or Science, and is No. 26 out of 926 institutions in that regard as rated on a per capita basis. Located on nearly 1,200 acres in Riverside, the park-like UCR campus is at the heart of the Inland Southern California region, which hosts a population of more than 4 million. The university is located 60 miles east of Los Angeles and 88 miles north of San Diego. Nearby Ontario International Airport has daily flights to most of the nation's major cities. In addition to the main Riverside campus, the university operates the UCR Palm Desert Center, a facility that provides educational programs, research, and outreach to meet the needs of the greater Coachella Valley region. Another asset, located in downtown Riverside, is the UCR ARTSblock, which includes the Barbara and Art Culver Center of the Arts, the Sweeney Art Gallery, and the California Museum of Photography. UCR is designated as a Hispanic-Serving Institution, and is a member of the Hispanic Association of Colleges and Universities. The campus competes in Division I of the NCAA. The "Highlanders," mascot is a bear and athletes compete in 17 sports and are proud members of the Big West Conference.